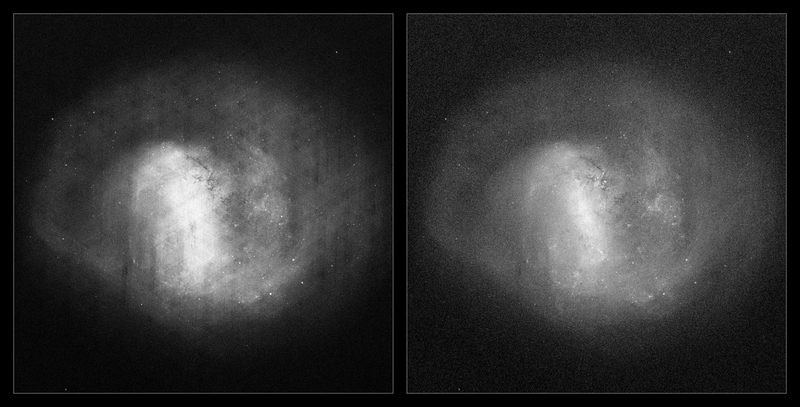 The Large Magellanic Cloud (LMC), one of the nearest galaxies to our Milky Way, as viewed by ESA's Gaia satellite after its first 14 months of operations. These views are not a photographs but were compiled by mapping the total density of stars (left) and the total amount of radiation, or flux (right), detected by Gaia in each pixel. On the left, the image based on the stellar density shows the large scale distribution of stars in the LMC, clearly delineating the full extent of the spiral arms. It is peppered with bright dots – faint clusters of stars – and presents a series of diagonal stripes along the central thick structure, or bar, which are an artefact caused by Gaia's scanning procedure and will gradually decrease as more data are gathered throughout the lifetime of the mission. On the right, the image based on the total flux is dominated by the brightest, most massive stars, which greatly outshine their fainter, lower-mass counterparts. In this view, the bar of the LMC is outlined in greater detail, alongside with individual regions of star formation like the bubbling 30 Doradus, visible just above the centre of the galaxy.